Quick update. All is going well since the move!! I’m having a hard time keeping chaeto alive, but other than that, everything is pretty steady state. I’m running floss and the tunze 9001 nano skimmer only these days, with the rock and WC’s (and chaeto if I can keep it growing) doing the rest. Saw the oddest thing after a WC yesterday — all the bristle worms started spawning (? ), sticking out of the rock and spewing orange dust everywhere. I’ve included a couple of chemical warfare pics. Ricordia beats purple digi, tricolor beats purple stylo. Green digi and Setosa seem to be tied. Conclusion? Purple is weak! Also .. urchin still wearing his zoa hat. Funny critter. Wow!!! Your tank is amazing! I just read through the entire thread & made notes! My 32 gal BC is about 3 months now. . I'm very irritated with my CL skimmer, of course. I'm going to try the longer tubing and prop it up higher trick. But would u recommend the tunze after all this time? Also, kudos to you. If I read right, this was your first SW tank?! I'm impressed! Another question... the lid is tight, and I find I dont get a lot of evaporation. I have difficulty maintaining my pH . It was suggested by another 32BC owner that it's a challenge for them also, likely the result of less oxygen. Makes sense. Again, nice tank!!!! Nice nice nice!!! "OOPS! 樂 Regroup, seek suggestions, learn, Go! this tank is awesome! following along! Sorry for the late response!! Yes, this was my first SW tank. I've been very happy with the Tunze skimmer; others don't like it but once I got it dialed in (took a week or two), it's been pulling pretty decent skimmate ever since. No maintenance. pH used to be very stable -- I found by keeping the feeding door open to help with evap and oxygenation (my powerhead is pretty close to the top of the tank, so it provides surface disruption) and running lights on the back for the chaeto at night (opposite the DT lights), it kept things pretty much in check. I also think the Tunze skimmer is doing a good job at aeration, even if it's not the most efficient skimmer in the world. Welp, complacency kills in this hobby, right? Monday night my ATO resovoir was running low, so I added more Kalk and RO water, and gave the kalk time to settle out. What I didn't do is check to make sure the pump was clean; I'm guessing it had been sitting in the old kalk sludge at the bottom of the resovoir. Once I had the pump suspended in the middle of the resovoir and it seemed like the lime had mostly settled, I turned the pump back on. I checked to make sure it was functioning, and while the water coming out was slightly cloudy, I didn't think much of it, since my kalkwasser has never been clear. Everything else looked good so I went to bed. I should note at this point that this has been my process for 12 months or so, so I may have gotten sloppy in implementation. I got a call from my wife at lunchtime on Tuesday that she thought there was a gas leak... I couldn't break away, but had her check some things. An hour later, one of the kids notices a dead fish. Uh oh. I get home on Tuesday night, and the whole house REEKS of dead ocean, the wife and kids have evacuated, and the tank is a swirling mess of milky white decomp. It's pretty close to a total loss. I did a 20ish gal WC on Tuesday night, swapped out filter floss and cleaned the skimmer, and dosed with a double dose of Seachem Prime to try and bind up some ammonia. The clowns, gobi's, wrasses, urchin, shrimp, stars, etc were all dead. Most of the coral. Ammonia tested 5ppm on a cheap API test kit, and > 2 on the Redsea kit. After WC. I did a 90% WC yesterday and dosed again with Prime. A handful of Zoa's look like they might pull through, and my duncan is still flourescing. One setosa still has some flesh that's not pulling off and oddly a branch of green slimer looks like it might pull through, but the rest is toast. It's amazing how quickly a tank can crash!!! Best guess I overdosed with lime solution, raised the pH in the tank, which caused something to die, and then the whole thing turned into toxic soup. Crazy thing is my ATO resovoir is only down < 1/10 of a gallon, so it was just a few spurts. Another theory is that I ****ed off the 'native paly' that filled up a big chunk of the inside of the tank (came with my LR and has grown prodigiously), and then that nuked the tank. My macro seems kinda happy, so there's that. I'll post pics soon. Ammonia spiked again, but the smell has disappated. I'm hoping that some of the coral might survive, and plan another big WC/prime dose on Saturday. Thanks for all your help RC throughout this whole process. I'll post more when I decide what to do next. I was thinking about rescaping the tank, so at least I can do that without worrying about messing up the SPS. Here are some pics of the carnage. I’m at the ophthalmologist now to have my eyes checked out — I think I may have been exposed, flu like symptoms, eyes burning, vision getting worse. 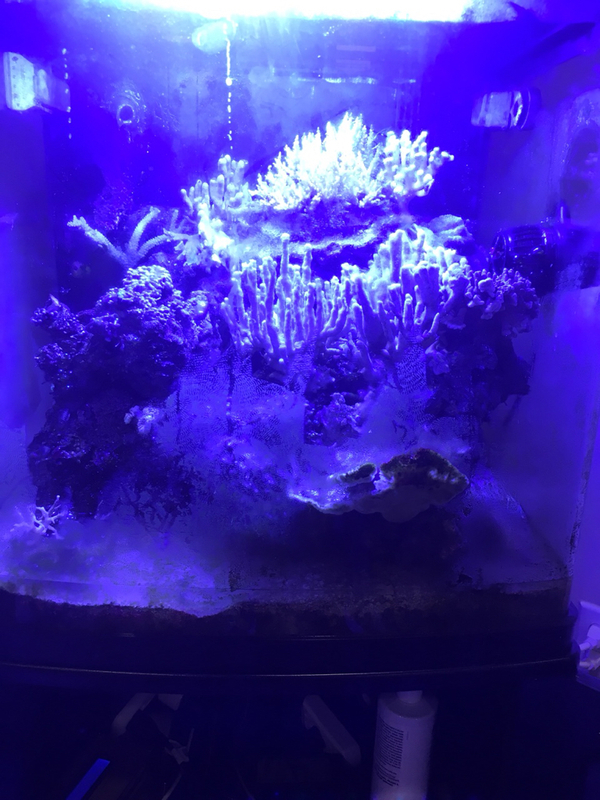 I had a large colony of ‘native paly’ - ugly green polyps that grew out of some of the live rock I added at the beginning. Perhaps a mild pH spike ****ed them off, they expelled palytoxin that killed the fish and sps, and then the ammonia killed the inverts. Currently only things that appear to be holding on are some (evil toxic!) zoa’s, a Duncan, and green slimer. All have a nice mucous coat that would possibly protect them. Lessons learned : adding something with a pH of 12 to your tank automatically can be dangerous, and palytoxin ain’t nuthin to mess with !! Oh wow. That's so upsetting. I had a heater overheat once and kill most everything. Sigh. I'm glad there are some survivors though!! I've always been afraid of plays, ha.